The Dearborn Historical Museum is home to thousands of artifacts from the early pioneer days to the present day. Everything from large farming equipment to delicate textiles; if it came from Dearborn or belonged to someone from Dearborn, it’s our job to take care of it. The biggest difficulty with housing a collection this robust is knowing where everything is! Right now, the museum is in the process of a massive re-inventory. Volunteers and staff work together to make sure we have not only a hard-copy, but also a digital-copy of every artifact in our collection. It’s a big task, but it’s important that it gets done. Re-inventorying tell us exactly where everything is, what condition it’s in, and how many of a specific item we have. Knowing this information helps us plan new exhibits so we can share our collection with you! 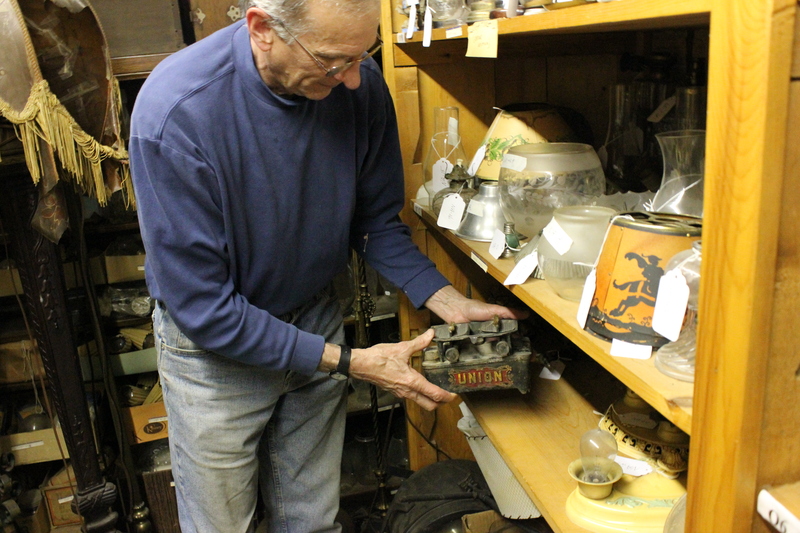 First, a member of our staff or a volunteer (pictured here is Tom Saroglia, one of our regular volunteers) takes an un-inventoried artifact and looks for any identifying numbers, called accession numbers. An accession number shows the year an artifact was donated and which part it was of a specific donation. If an accession number can’t be found, we give the artifact an “NA” number or un-accession number. This allows us to keep track of which artifacts we need to look at again or research. This is also the time when staff can determine if we have too many of a certain artifact– more than three of a clothes iron is two too many that we can’t use! 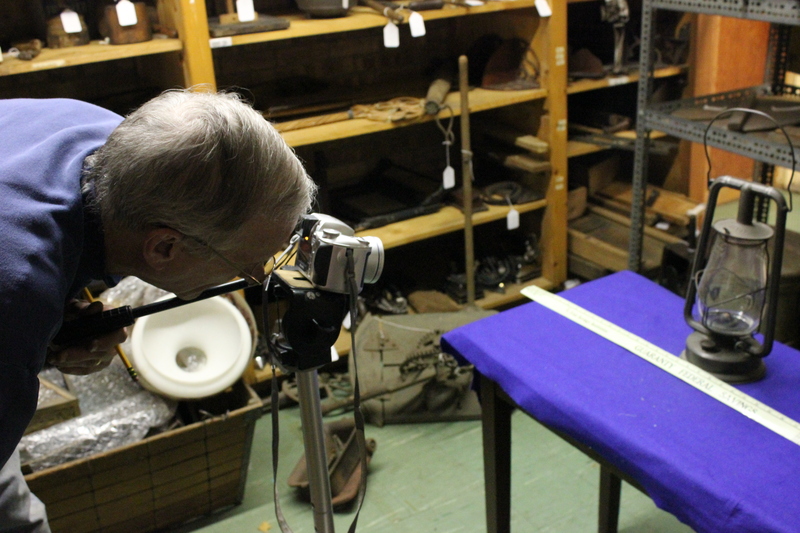 Next, we photograph the artifacts. This allows us to look up items and see them without having to touch them, saving the items from damaging oils in our hands. Having a digital photograph also helps us when the artifacts are entered into our computer network. 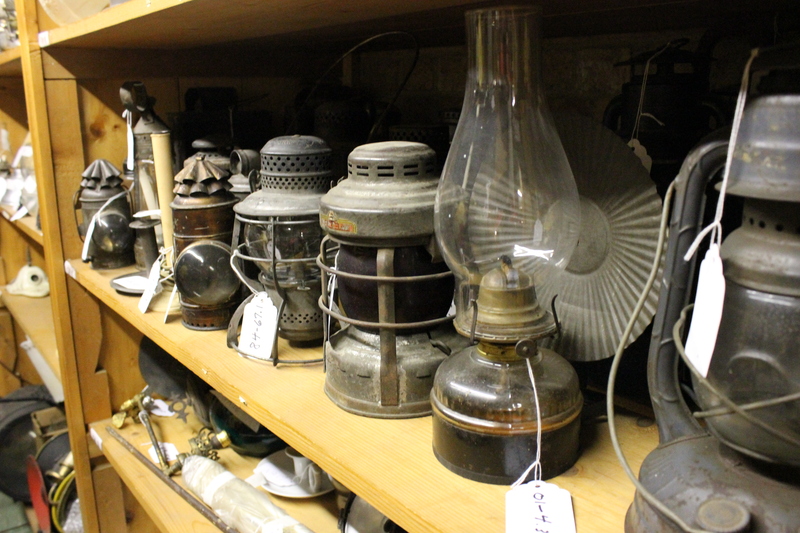 When we search for items from a certain era or type, we can see all of them. This is a great help when trying to put together exhibits, doing research, or locating the artifact in the storage areas. Once the artifact’s number has been sorted out and its been photographed, it’s given a tag with its number written on it so it can be quickly identified and shelved. Then, it’s on to the next artifact! Given the museum’s extensive collection, we don’t expect to finish the re-inventorying for some time, but having everything organized makes other museum work much easier. Welcome to the Dearborn Historical Musem’s blog! Our goal with this blog is to let people see the everyday work and preperation that goes on here at the museum. Every month we’ll put together at least one post about what we’ve been doing. Whether it’s putting together an opening for an exhibit, a restoration project, accessioning new artifacts, or just the day-to-day, you’ll get to see it. So, take your time, look around, and let us know what you think!